What’s that you say? Well, a good BB cream. BB – Blemish balm for the uninitiated. Nope, it’s not the private domain of girls’ anymore. Guys get in on the action too. BB cream is a good grooming product to have and use all year round. A good blemish balm helps to even out patchy skin colour and some even offer additional benefits beyond that, with sun protection and even moisturising qualities. A great find from a recent trip to men’s grooming mecca aka Seoul is this BB cream Get Ready from DTRT Men. The acronym stands for Do The Right Thing and that’s about as straightforward as it gets. Targeted at men, they are from the same family that gives us Dr. Jart+. The packaging is simple, straightforward, and masculine. The latter quality is important for new inductees to men’s grooming who might feel self conscious buying any men’s grooming product that doesn’t come in a simple looking (boring? ), manly black, grey or brown box. 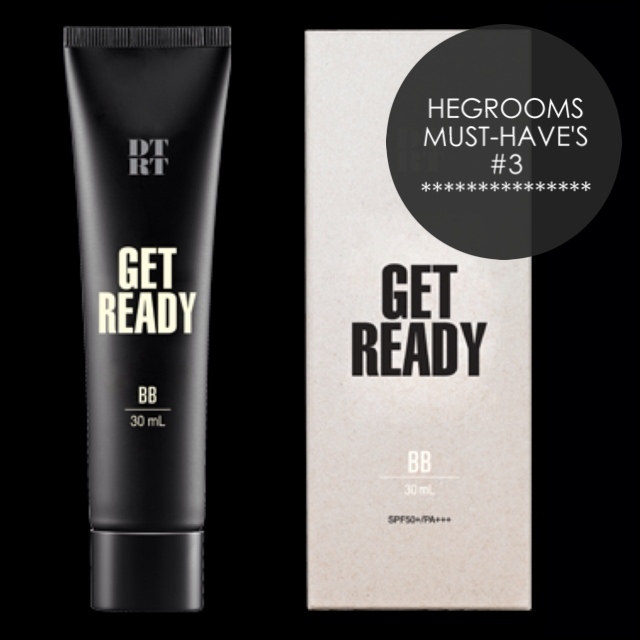 In terms of quality, Get Ready BB cream offers SPF50+/PA+++. It balances skin tone and also moisturises your skin. Armed with Eco-herb complex, it helps to also control sebum so it works well for guys with oilier skin. An added function is that it also lightens your skin tone with consistent use. There is only one shade available and it suits someone with a light to medium tan complexion. It’s definitely not for those with darker tanned skin as it could result in an unnatural fairness, and you sure do not want to look like you face-plunged into a bag of flour. Why did this make it into the spring must-have list? Two reasons. One of them is texture. The texture of the Get Ready BB cream is light. Very light in fact. This is perfect for Asian men as we tend to have oilier skin due to the tropical climate and larger pores. A heavy BB cream not only makes our face look greasier but it is also very uncomfortable. A heavy version also potentially clogs pores, hence causing unwanted acne issues. This product provides a light and smooth finish with minimal shine. With its moisturising quality and signficant SPF, it could also double up as a moisturiser for those with really oily skin so they can skip the moisturiser altogether. The second reason why this is a spring must-have is that this is a gentle product. It is mild to use, and this works well for our Asian male counterparts living in countries with more than just summer all-year-round. Often, most of them experience patchy, flaky skin due to climate changes in humidity and temperature when the seasons transition, especially from the dryer winter to spring. This is especially pronounced for those with sensitive skin. This gentle condition of this BB cream therefore helps ease the skin condition of those affected and gives the skin an overall healthier looking tone and appearance. To apply, dab little “dots” of the product all over your face and neck (yes, trust me, you do want your face and neck to look like they belong to the same body). Then, using two or three finger tips, gently pat/press to spread those “dots” to cover your face. This application offers a more even distribution, and by dabbing rather than massaging, the product stays on the skin instead of being pushed around. As a last step, warm your palms by rubbing them against each other. Then rest both palms over your face lightly, and apply very light pressure. The body heat from your palms will help “seal” the product to your skin and also facilitates absoprtion, thereby increasing the efficacy of the product. After that, finish of your look by throwing in a bit of swagger and you’re ready to get out of the door and conquer the world. Suitable for: All skin types, even oily and sensitive skin. Good for humid climates. Posted on April 22, 2014 April 22, 2014 by hegrooms	This entry was posted in Face and tagged asian men, australia, bb cream for guys, beauty for men, dtrtmen, glowing skin, good skin, grooming products, healthy complexion, how to, indonesia, korea, london, malaysia, men's grooming, milan, myeondong, new york, nyc, paris, philippines, seoul, singapore, skincare for men. Bookmark the permalink.